Dean Koontz is one of the most-read authors in the world with over 400 million books sold. Over twenty of his books have hit #1 on The New York Times bestsellers list, and several movies have been made from his writing. His work has been nominated for the Hugo, World Fantasy, Prometheus, British Fantasy Society, and Bram Stocker Award. He frequently incorporates elements of horror, science fiction, mystery, and satire in his writing, and Rolling Stone has hailed him as "America's most popular suspense novelist." Matthew Peterson: Hey, welcome to The Author Hour: Your Guide to Fantastic Fiction, which can be found at www.TheAuthorHour.com. I’m your host, Matthew Peterson, author of Paraworld Zero. Last week I had a high fantasy episode with Carol Berg, L. E. Modesitt Jr, Dennis L. McKiernan, and Diana Pharaoh Francis. I’m really excited about the show today. This week's theme is dragons and creatures with Dean Koontz, Christopher Paolini, R. L. Stine, and Todd McCaffrey. Combined, these authors have sold around three quarters of a billion books--enough for everyone in the United States to own two or three copies. 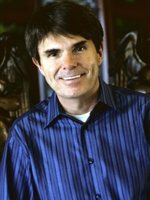 My first guest today is Dean Koontz, the international bestselling author whom Rolling Stone hailed as "America's most popular suspense novelist." His work has been nominated for the Hugo, World Fantasy, Prometheus, British Fantasy Society, and Bram Stocker Award and has also been adapted into several movies. Between hitting the #1 spot on the New York Times list over 20 times and selling over 400 million books, Dean Koontz is easily one of the most-read authors in the world. Thanks for being on the show today, Dean. Dean Koontz: Well, thanks for having me there. Matthew Peterson: Now after selling so many books, do you feel a certain pressure from your readers to give them more and more quality books? Dean Koontz: I feel no pressure from readers or anybody. I’m just grateful I never had to earn honest work, so I’m delighted this has played out. The biggest pressure I ever get is from myself, and I sort of long ago learned you can’t please everyone all the time. So some people like things more than other things and you can’t scope the market and try to imagine what they want, so you just have to sit down and please yourself every time out of the gate. And that’s what it’s all about. But this is all about doing something you love, and so if you allowed yourself to be pressured too much, you’d stop loving it. Matthew Peterson: Well, that philosophy is a good one. A lot of people have enjoyed your books, and you’ve written quite a few so far. I wanted to talk about one of your latest series: The Dean Koontz’s Frankenstein. What gave you the idea to reinvent Mary Shelley’s Frankenstein? Dean Koontz: Well, there were two things that sort of happened around the same time: 1. Some Hollywood producers--that’s a word that should come with ominous music in the background. Matthew Peterson: [laughs] Da, da, da . . . .
Dean Koontz: But they came to me and wanted me to reinvent Dracula for a television series. And I said, “Ah, there’s just endless vampire stuff all the time. Reinventing it would yet once again... doesn’t strike me as anything interesting. But what if we reinvented Frankenstein?” And at first they were reluctant, but then they thought about it and said yes. And as they were deciding whether to say yes or not, it got to be a more and more appealing thing for me, and I was at the moment re-reading The Abolition of Man by C. S. Lewis, which I read every few years again. That’s a most amazingly timely book--now more than when he wrote it 60 some years ago. And it was in reading that book I got the idea of how to reinvent Frankenstein. And sort of it was that C. S. Lewis’ book, a non-fiction piece, that really inspired readdressing this famous piece of fiction. And of course, when they filmed it, they dropped all the stuff that reinvented it and turned it into a sleazy mess. So, I took my name off it. Dean Koontz: But I’ve enjoyed writing them. Certainly the material is more timely than ever, in our time. The hubristic scientist, the potential of science to become scientism, all of those things are now more true than ever, so it’s an interesting thing to do and I’m working on the fourth book now, which I never imagined. I thought three would be the limit. Dean Koontz: Well, and when you read The Abolition of Man, you’ll understand why, and that’s why I end up quoting Lewis at the front of each of the first three books. And I’m getting my motivation on the second series--three more books--from Chesterton. I came across a Chesterton quote and it was just perfect for Lost Souls, which is the first of the new Frankensteins--comes out June, I think. Matthew Peterson: Well, what can you tell us about the Lost Souls? Dean Koontz: Well, the action moves from New Orleans to rural Montana. And the new Victor who was at the end of book three... I don’t want to give anything away. There is suddenly a new Victor, but he has a totally different idea about how to approach the creation of a new race. So all of Victor’s wild ideas and over-the-top things in the first three books will be totally different now. And what he’s creating is actually a little spookier than anything I’ve quite come across before. Dean Koontz: Those who survive the first series show up again because they come to realize this isn’t finished. Matthew Peterson: Well, with your Frankenstein series, there was a lot of changes from the old Mary Shelley one. Like Frankenstein, for example, in the Mary Shelley books is the creator; he’s the doctor, the inventor of this monster. In yours it’s more contemporary, modern day; Frankenstein is the monster, in a sense, right? Matthew Peterson: Yeah, yeah. That’s interesting. And you know, I didn’t watch the movie. I think it was in 2004. That whole year I was writing my first book and just didn’t watch any TV or movies or anything. So I understand, like you said, you pulled out of that movie. A lot of your books have been put into movies. Is there a particular movie that you did like the adaptation of? Dean Koontz: I thought the best one was the mini-series of Intensity. And in that case I got to choose the writer and the director, and it made a world of difference, instead of just getting the average megalomania--maniacal--director to deal with it. So I thought that one came out pretty good. There were moments of other pictures I liked, but none of them fully succeeded. I just haven’t had much luck with Hollywood, but my world view and the average world view of Hollywood is so different that I think they just get it in their head if they do buy something of mine, they have to turn it 180 degrees around. And when they do that, they ruin it, so I basically am very hesitant to sell film rights anymore. I only do it with people whose body of work I can look at and say, “Okay, they’ve got something going on.” But that doesn’t happen very often anymore. Dean Koontz: Well, you know. I’ve written... I don’t know if it’s 6 or 7 screen plays. Some were theatrical. Some were TV. All were green lighted. And all but two of them were actually produced. I had them remove my name from several of them anyway. Dean Koontz: Or diminished use. In one case I paid as much to get my name taken off the posters as they had paid me for the film rights, which is not good business. That was the movie Hideaway, which was a disaster. Matthew Peterson: Well, hopefully we’ll see some more in the future, or maybe a better adaptation of Frankenstein as the series continues. Dean Koontz: Well, there’s somebody very interested all of a sudden, and they’re very strong producers. So we sat down and talked about it, and they understand perfectly what it is. So I’m a little hopeful. I don’t know. We’ll see. Matthew Peterson: Oh, good. Well, that’s something to look forward to. Well, let’s move on to the Odd Thomas series. That’s hugely successful. And I’m sure all these TV shows like Ghost Whisperer and Ghost Hunters have helped fuel the interest in this genre. What gave you the idea to write about a guy who communicates with the dead? Dean Koontz: I was sitting here working on the face, and suddenly the lines came into my head, “My name is Odd Thomas. I lead an unusual life.” And I knew it had nothing to do with the face. And I turned to write it down, because something about it appealed to me, and the next thing I knew I’d written out an entire first chapter by hand, which I’d never done before or since. Dean Koontz: And it was almost like automatic writing, it so fully came to me. And what I thought originally was going to be the most interesting thing about it was the notion that, in all these stories about people who see the dead or talk to the dead or so forth, they pretty much lead ordinary lives, except they have this ability. And I thought, “If you actually had this ability or any actual amazing power, you wouldn’t lead an ordinary life at all.” It would be utterly impossible, the input to your mind from being able to see these things would be so over the top that you would have to defensively cut back on your interaction with the world. You’d have to lead a very restricted life in order to cope with this hugeness that is your talent. And as a consequence, I though Odd was going to be interesting for that reason--what a constricted life he would lead--and he does in many ways. But what he became more interesting to me for was his humility. And that seems to be the central thing that has driven most of the interest in the series. A lot of people just love the character, and so do I. I’ll be doing, God willing, three more books with him. Matthew Peterson: Well, that is why people continue reading, because they like the characters. The story is great--the unique aspects of what he does--but it’s who he is that really draws readers in. Dean Koontz: In book four, I suddenly realized what his ultimate destiny was, and so I’ve been really excited about doing three of them in a row and putting them all out within say 14 or 15 months. And that’s my current intention. Matthew Peterson: So we’ll be able to see some more, then. Well, that’s good. Well, one of your latest novels, Breathless, came out in November. Again, it looks like you’re touching on the science fiction or the fantasy elements. What will readers see in Breathless that they might not see in your other books? Dean Koontz: I don’t want to give anything away, because it’s quite unusual. When I delivered it, I thought there were a couple things in it that people were going to say, “Oh no, no, no” or get argumentative about. And to my great surprise, everyone who’s read it in my professional life--publishers, editors--worldwide have just gone over the top about it. And I at first was taken aback. I was waiting for somebody to call and say, “How dare you say this” or “Why would you think you could get away with saying that?” And instead, nobody ever raised those issues. And it’s been one of the best received books I’ve ever delivered. And I think it’s because of one thing: Everybody who reads it says to me, “I felt so up at the end of it. I was so full of hope, and I felt so upbeat.” And I think I’ve stumbled on the right book for the right time. Nobody’s full of a lot of hope right now. So a book that actually gives them that apparently will be seen as more satisfying than usual. And that’s all I’m going to say about it. It’s got a dog in it, but it’s not just a dog story. And it’s got an element... I won’t say whether it’s science fiction or what it is. It’s just very different. Matthew Peterson: Well, I know a lot of your books do have some sort of dog element in it. That’s interesting. I’m excited to read Breathless, ‘cause I haven’t read Breathless yet. Matthew Peterson: Let me ask you one last question. What are you working on right now? Dean Koontz: Right at this moment, I’m working on Lost Souls, the Frankenstein. And when that’s finished I will immediately move on to a book called What the Night Knows, which is an idea I’m just kind of bouncing off the walls about. So it’s always a great thing when something excites you very much, but then if it’s exciting you very much and you’re working on another book, you have to tamp that down and get the other book finished. So I’m working on Lost Souls and enjoying it, but ready to start What the Night Knows the moment I finish it. Matthew Peterson: Well, good. I’m excited to take a look at those. Well, we’re about out of time, but it’s been a great joy speaking with you today. I’ve been speaking with Dean Koontz, the #1 New York Times bestselling author of Odd Thomas and Frankenstein. Thank you so much for being on the show today, Dean. Dean Koontz: Thank you for having me there. I hope I was moderately coherent. Matthew Peterson: [laughs] Very much so. Alright, make sure you visit www.TheAuthorHour.com to listen to Dean Koontz’s bonus question. Don’t go away, I’ve got Christopher Paolini coming up next, followed by R. L. Stine and Todd McCaffrey.